The Baita alle Cascate can easily be reached from Pozza di Fassa, passing through the San Nicolò Valley, one of the most spectacular valleys of the Dolomites. It is a very easy walk, that does not require any particular effort, suitable for children and grown-up people as well. The excursion offers enchanting views of a still intact nature. Flowery meadows, with thousand colours, encircled by the most beautiful mountains of the world: Cima Undici e Cima Dodici, the Monzoni Group, the Costabella, Cima Uomo and Col Ombert. Surrounded by a romantic and at the same time wild atmosphere, we shall reach in a short time the Baita alle Cascate. You will never forget the scenary that appears before your eyes. In a pleasant hollow, under a silver mountain, many little falls of pure water gush out. Here rises the Rio San Nicolò, the stream that flows through the San Nicolò Valley. 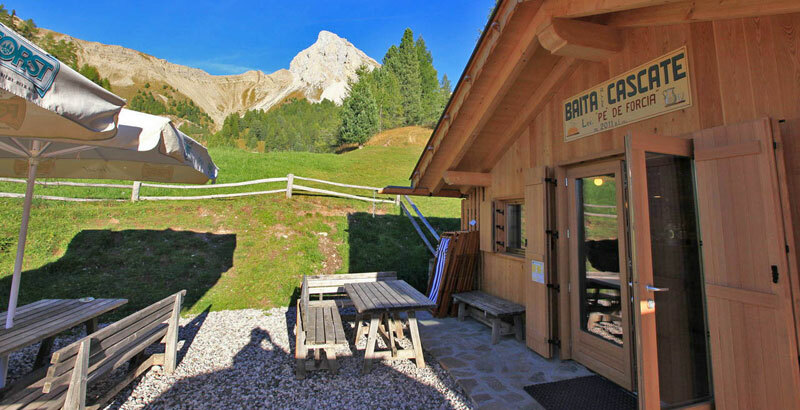 Only a short way away, situated on a green meadow in the sun, here is the Baita alle Cascate. Mr and Mrs Bernard will welcome you. In the open air or in the intimate little hut you will gave the opportunity to taste some typical, very tasty dishes: polenta (thick maize porridge) served with mushrooms, local cheese and sausages and, for people who loves sweets, blueberries, raspberries and high mountain's cream. In this corner of heaven you will relax in the sun and take some little walks in the surroundings of the fall or rest at the hut before starting a more difficult excursion towards Passo San Nicolò, Contrin Valley, Ciampac and many other destinations.